The Yellowstone and Grand Teton National Parks Travel Guides are a resource for those planning to tour Yellowstone National Park and/or Grand Teton National Park. The adjacent national parks are typically visited at the same time and offer very different experiences. Yellowstone offers the world's largest concentration of thermal features such as geysers and hot pools. Grand Teton features one of the world's most spectacular mountain ranges. Both parks offer outstanding opportunities to view wildlife. Yellowstone National Park lies in northwest Wyoming immediately to the north of Grand Teton National Park. Ninety-six percent of the park is located in the state of Wyoming, another three percent is in Montana, and one percent is in Idaho. This guide provides a list of campgrounds for the park and neighboring areas, a list of accommodations for the park and neighboring areas, and a section for each of the major areas in the park. Each section describes the area’s special features, points of interest, suggested hikes and/or scenic drives, recreational opportunities, and available services, including camping, lodging, and location of visitor centers. A blue Yellowstone National Park Travel Guide Menu is provided at the top of each page to allow you to navigate to each section. A wide variety of organized outdoor activities are available at the park. These include: day hiking, backcountry camping and hiking, boating, bicycling, cross country skiing, fishing, viewing wildlife, horseback riding and llama packing trips, and guided tours. See the NPS’s Things to Do in Yellowstone National Park web page for more information. The NPS also offers Ranger-Led Programs throughout the summer. Explore Yellowstone’s backcountry on a half-day interpretive hike with a park ranger. Visit lesser-known hydrothermal areas, explore wildlife habitats, and experience a slice of Yellowstone’s wilderness. Program locations vary daily. Hikes rated from easy to strenuous. Some hikes not recommended for people with heart, breathing, or serious medical conditions. Information and tickets are available at these visitor centers: Old Faithful, Albright (Mammoth), Grant, Canyon, and Fishing Bridge. Yellowstone National Park has an abundance and variety of wildlife unequaled in the United States outside of Alaska. Generally the number and types of animals a visitor will observe is a matter of luck. When there are many cars pulled over or slowed down on the park roads, there is some wildlife present. Visitors are requested to use pullouts when observing wildlife and to keep a safe distance as all of Yellowstone’s animals are wild and potentially dangerous if they feel threatened. Never pursue, block, or chase wildlife by foot or in a vehicle. Never feed any park wildlife. When photographing or observing wildlife, you are legally required to stay 100 yards (92 m) from bears and 25 yards (23 m) from any other animal. Use binoculars or telephoto lenses to view or photograph the wildlife close up. Avoid loud talking, door slamming, and running. The broad valleys around the park will often contain large numbers of grazing animals. 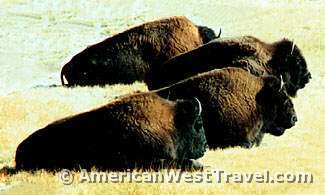 You will probably see large numbers of bison, elk, and pronghorn. Moose are more solitary and prefer low lying swampy or marshy areas, or areas with willow trees, as that is what they eat. Bighorn sheep are less common and prefer mountainous areas. The wolf has been re-introduced to the park. There is good chance of observing wolf in the Lamar Valley near Roosevelt. The high valleys north of Yellowstone Lake are considered prime grizzly bear habitat. If you want to hike in bear country, traveling in a group is advised. In areas that are not open, make enough noise so bears know you are present and have a chance to retreat. Check with park rangers for any possible trail closures due to high bear activity. The park has nine lodging facilities open during the summer and two during the winter. Accommodations vary from rustic cabins to modern motel-style rooms with private bathroom. Reservations can be made by phone or online through the park concessionaire. Reservations are strongly advised well in advance of any planned trip. Please see our Lodging in and around Yellowstone National Park page for more details.